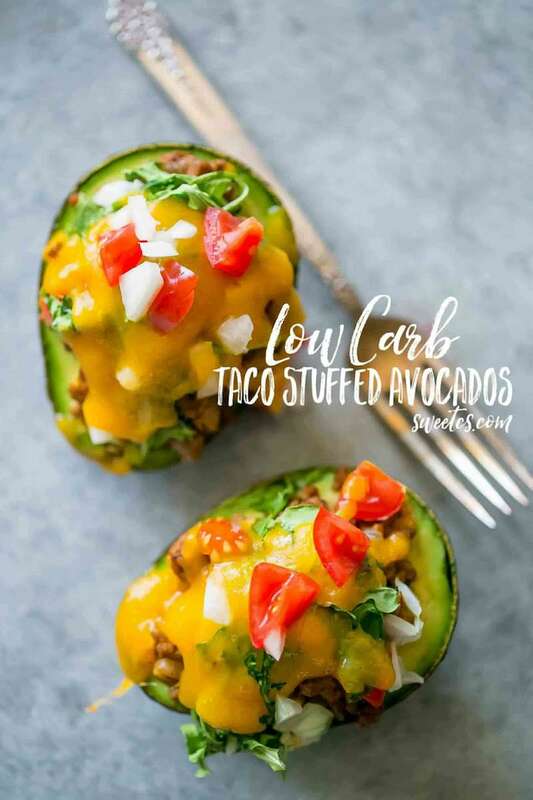 Low Carb Taco Stuffed Avocados are a rich and filling meal that won’t weigh you down – perfect for lunch or dinner! 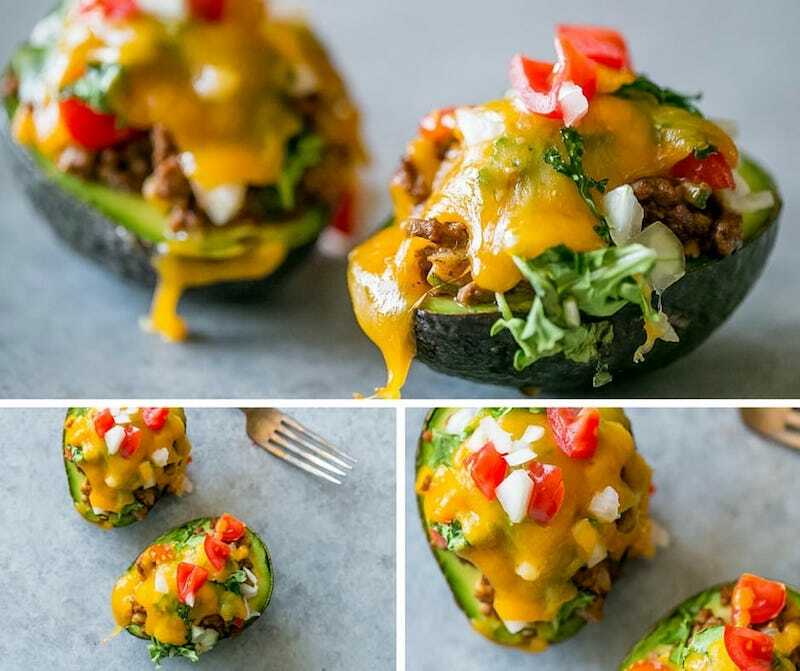 Cheesy Taco Stuffed Avocados are a stuffed avocado recipe that you won’t be able to get enough of – and a perfect easy healthy family dinner your kids will actually want to eat! With spring in full swing, it’s a bit easier and tastier to eat delicious, low-carb foods since there are so many beautiful, fresh vegetables in season. This is the time of year I’m often feeling pretty bad due to crazy schedules and increased activity which throw my rheumatoid arthritis for a loop – so I really try to focus on eating healthier when fruits and vegetables as much as I can at home in summer. 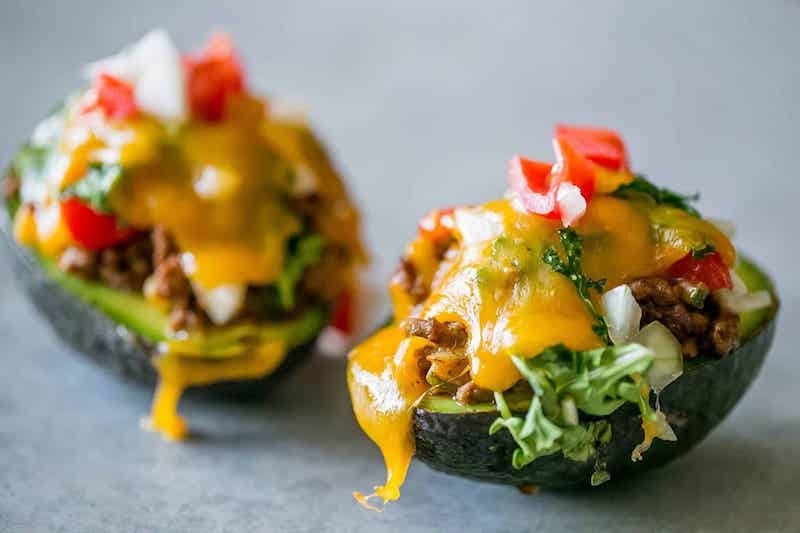 This recipe for Cheesy Taco Stuffed Avocados is a perfect indulgent but healthy meal- loaded with veggies (the taco mixture we’re using is packed with hidden vegetables) and lighter on the meat and cheese, this meal is packed with heart-healthy fats, protein, fiber, iron, and calcium. And trust me when I say nothing about it tastes like diet food! 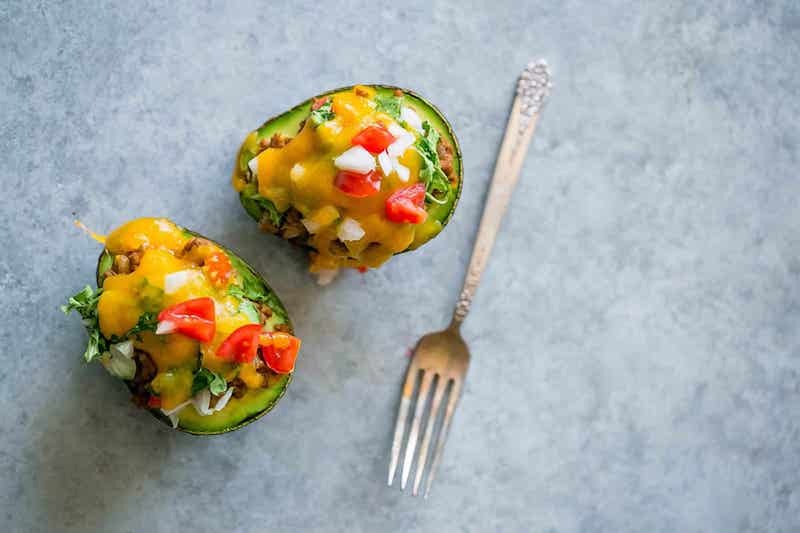 This is one stuffed avocado recipe you’re going to want to eat again and again and again – and even though this recipe is perfect for paleo, low carb, and keto diets – EVERYONE loves this quick, delicious, and hearty meal! just take me to the cheesy taco stuffed avocado recipe already! If you’d rather skip my (very helpful, i think) tips and tricks – including how to keep an avocado from turning brown – essential cooking info, and similar recipe ideas – and get straight to this deliciously easy stuffed avocado recipe and the stuffed avocado recipe video – simply scroll to the bottom of the page where you can find the printable recipe card. 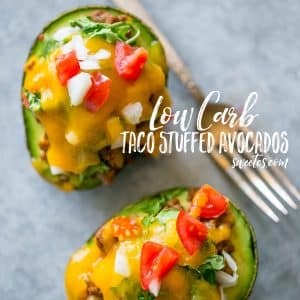 These avocados are filled with my favorite taco meat mixture – my low carb cheesy taco skillet! 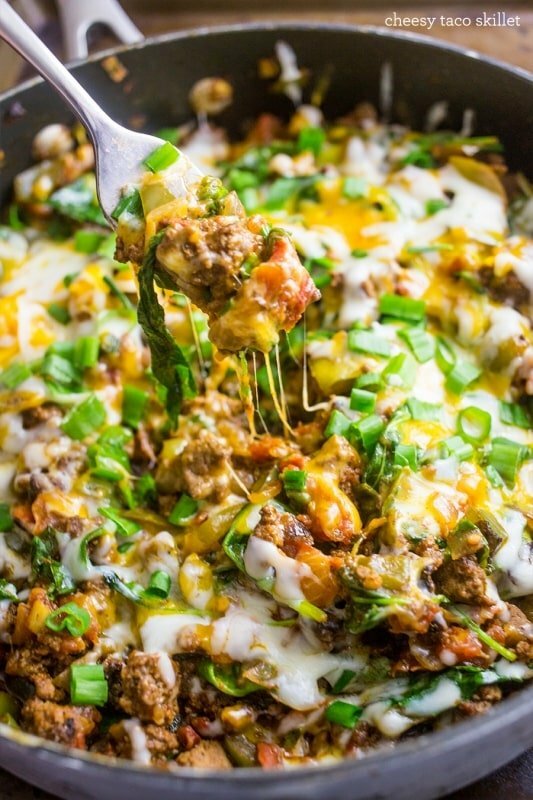 While you could use any taco meat to stuff your avocados, my top-rated cheesy taco skillet is our hands-down favorite. Not only is it BURSTING with taco flavor – there are a TON of hidden vegetables in the skillet that have helped tons of families incorporate more vegetables into their family’s dinners – without any fights! This cheesy taco recipe is one you’ll want to bookmark and eat again and again – and has tons of rave reviews. 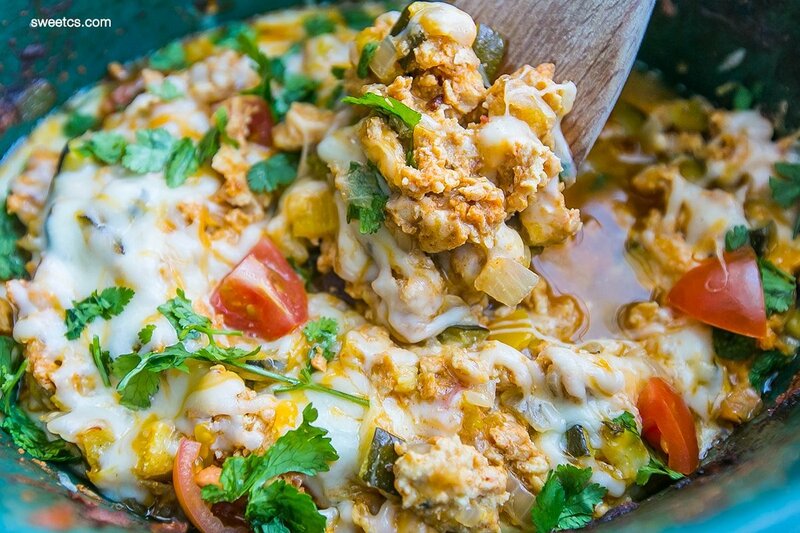 To get the full low carb cheesy taco skillet recipe, head here. 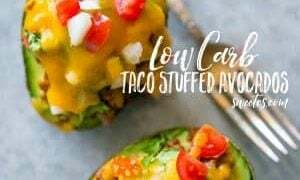 While my cheesy taco skillet recipe is amazing in this stuffed avocado recipe, I am adding a couple of my other delicious taco skillet recipes – one lower calorie, thanks to lean ground chicken – and one that is vegan AND paleo for a low carb vegan stuffed avocado you’ll swoon over! If you’re looking for a bit of a lighter version, I also have an unbelievably delicious slow cooker chicken taco bowls recipe that is amazing in this delicious cheesy stuffed avocado recipe. 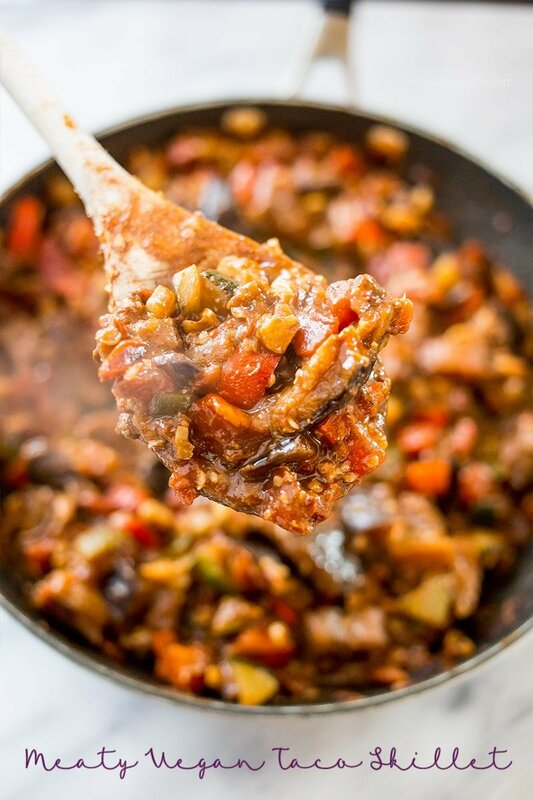 Low Carb Paleo Vegan Taco Skillet Recipe that tastes rich and meaty – you’d never know there was no meat or cheese in the dinner, really! This vegan taco skillet is amazing for vegan taco stuffed avocados – and are full of protein and fat for a filling and fueling vegan stuffed avocado taco dinner that everyone will love! If you want this to still be a deliciously “cheesy” stuffed avocado, opt for a vegan cheese (we prefer almond cheese shreds) that melts well. You can also mix in vegan sour cream or some vegan cream cheese, too. 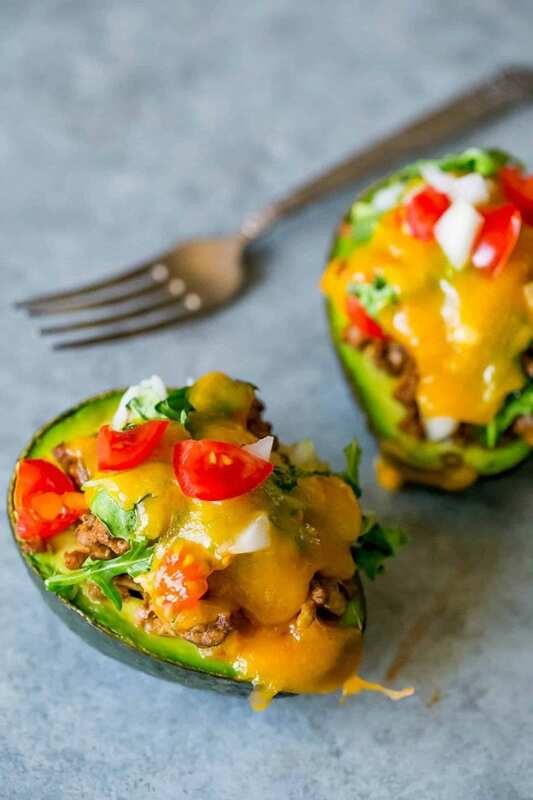 Once you’ve made the taco skillet, it’s all about stuffing the avocados and layering in more delicious fresh ingredients, for a creamy, rich, and grain/gluten free dinner – and planning the perfect meal around this amazingly delicious stuffed avocado recipe! This meal is perfect for a party or to take to work for a filling, healthy meal that won’t wear you out all day – and is so much fun at a dinner party for an interactive stuffed avocado bar your guests can fill and build their own perfect stuffed avocado dinner. These are so good- you won’t be able to get enough. And they can be pre-made and popped into a microwave for a few seconds to melt the cheese for a perfect, portable healthy lunch! If making for cold lunch meal prep, use lower fat ground beef and drain all fat thoroughly before seasoning. Store ingredients separately to prevent a mushy mess. If you’re packing this meal to go to work, keep the meat filling, shredded cheese, and avocado separate when refrigerating/bringing to work. If you pre-mix this or make them ahead of time, the moisture from the avocado and the taco meat will make the cheese soft and mushy – and the avocado will break down into a slimy, grey, and gross texture. It will still taste fine – but who wants that? Find my favorite BPA free meal prep containers here. They are microwave and dishwasher safe, super strong and sturdy, and don’t soak up gross smells like so many kinds of plastic food storage containers can. They also stack well and have different compartments so you can keep all the ingredients separate easily! When you go to eat this meal in an office, you likely won’t have an oven to pop the stuffed avocados in to melt the cheese like below. I personally really hate microwaved avocados -so I’ll just heat the taco mixture and then add in the avocado, stuff it in the avocado skin, and then top with shredded cheese and put a bowl, foil, or a lid over the whole avocado for a few minutes after heating the meat mixture so that the heat melts the cheese. It’s a perfect hack for at-your-desk healthy eating that doesn’t have that funky microwaved texture. I am ALL for store-bought pre-shredded cheese to save some time – but I find it can microwave weirdly thanks to the (usually gluten) coating that comes with the shredded cheese to prevent it from clumping in the bag. For this recipe – especially because I am relying on the taco meat’s heat to melt the cheese as detailed in the tip above – I want cheese that I very finely shred by hand because it melts the best and has the best flavor in such a simple, fresh recipe. Wait to cut your avocado. Avocados start to grey and discolor from oxidation immediately – wait to open yours until you’re ready to eat. When your meat is reheating, cut into your avocado to get it ready. These avocado boats are also delicious for dinner parties and make easy, portable dinners all in one handy piece! To have an unforgettable and delicious dinner party, consider serving these as a part of a taco bar – set out tons of filling ideas – like the slow cooker chicken taco bowls, vegan taco skillet, black bean salad, Knockoff Tito’s Tacos Salsa, One Pot Salsa Chicken Thighs Skillet – or more! Want to know my favorite kitchen tools to make all things taco? You’ve GOT to grab one of my favorite pans of all time – naturally non-stick, easy to clean, and heats evenly like cast iron- this Mineral Iron Pan is a DREAM. I keep it clean with a super easy to use chainmail scrubber, and I am happy to know I’m not adding gross chemicals to our food, while still getting a great nonstick surface! And of course, if you’re taking this meal to go, be sure you’re using a microwave safe food storage box- I love these glass options with lids – makes me feel a little better about not adding a ton of plastic chemicals for my husband who often takes his lunch to go at work! Avocados oxidize and start to get slimy and turn brown, black, or grey almost immediately after cutting into them – so whether you’re making this dinner for meal prep, a dinner party, or just an easy meal, it is always best to cut into the avocados right before eating. Since that isn’t always a possibility, check out my tips to keep an avocado from oxidizing too quickly! First, it helps to know what makes an avocado turn brown. Some fruits and vegetables (apples, potatoes, avocados, and more) contain phenolic compounds and enzymes that, when exposed to oxygen, will produce a brown-black pigment. Avocados cell walls protect the fruit from browning, but when bruised or cut into, those walls break, and the oxygen immediately starts reacting with the phenolic acid, turning the flesh grey and slimy. Splash lemon or lime juice on your avocado. Citrus is known to delay avocado oxidation and prevents as an anti-oxidant to avocado flesh – plus it just tastes great! Avocado treated with citrus can stay fresh for up to 1 day – be sure to wrap it tightly in plastic wrap or a plastic bag to prevent additional oxygenation. Brush your avocados with a bit of oil. Brushing a bit of oil over avocado flesh works as a perfect barrier for avocado flesh to keep oxygen from turning it brown. I like to use avocado oil, olive oil, or even a garlic-infused oil for delicious protection from oxygenation. Avocado treated with oil can stay fresh for up to 1 day – be sure to wrap it tightly in plastic wrap or a plastic bag to prevent additional oxygenation. Seal avocados with very tightly wrapped plastic wrap. Since oxygen causes the chemical reaction that browns avocados, keeping avocados away from oxygen is the easiest way to prevent browning. Seal cut avocados in tightly wrapped plastic wrap to keep them from oxidizing. Keep the Pit In/Nearby Avocado. For short times before serving, keeping the avocado with the pit can help it from oxidizing. I often toss the pit in guacamole when storing it in the fridge to help from extra browning too! I don’t know why, but it helps a ton! If you’re only using half an avocado, and storing the other half, store the side with the pit still in and use the one without so the other side is still fresh and delicious when you’re ready for it! Store with fresh cut red onion pieces. The same gas that makes you cry when you cut a red onion prevents oxidation in avocados. While this trick won’t work for recipes you don’t want an onion flavor and scent with (luckily in this taco stuffed avocado recipe it is perfect – but an avocado smoothie bowl probably wouldn’t be the best with a hint of red onion…. ), it is great in dishes whose flavor profiles work well with onion, like this cheesy stuffed avocado. 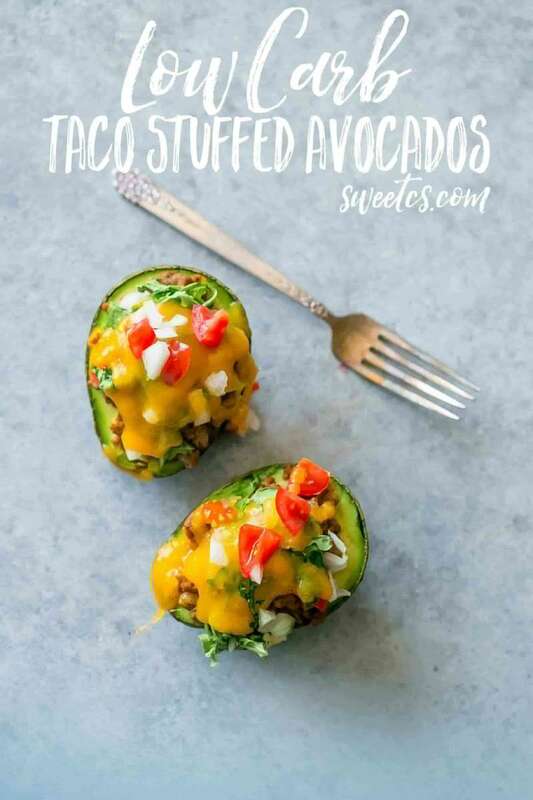 If you love this Taco Stuffed Avocados Recipe as much as I do, please write a five star review in the comment section below (or on Pinterest with the “tried it” button – you can now add pictures into reviews, too! ), and be sure to help me share on facebook! Disclaimer: Nutrition information is calculated automatically by my recipe widget as a guide to this recipes nutritional profile – but should not be treated as absolute fact. 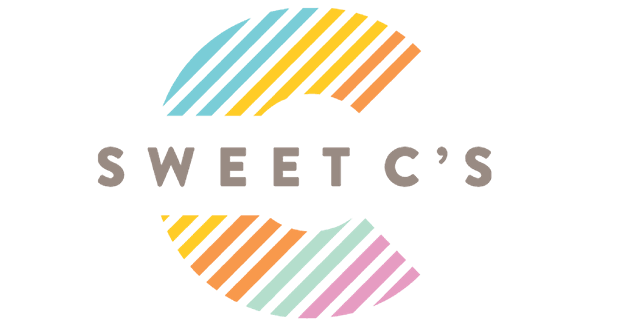 Variations based on ingredient size, brand, home measurement, or other outside issues are very possible. I am not a nutritionist and all calculations should be reviewed by a doctor or nutritionist if using in a medical diet plan. If preparing in the oven, bake for 15 minutes, just until cheese is melted. Garnish with fresh diced onion and tomato, serve immediately. Oh wow these sound amazing!